Well hello there! Everyday is an exiting day and as usual, today I will post something awesome and exciting. Mihmih. I guess you guys do have seen this everywhere. 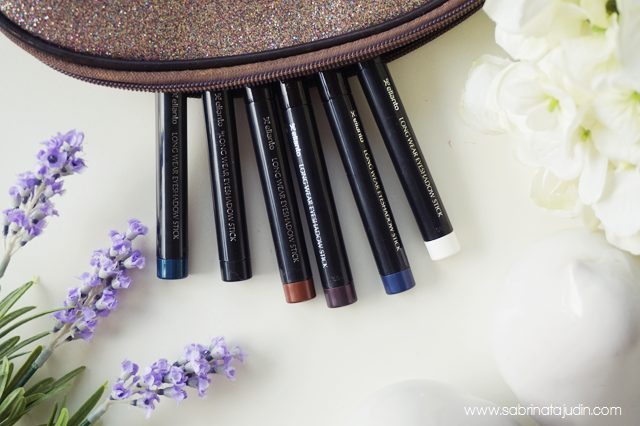 Recently Elianto have launch new range of eyeliners and they are the Long Wear Eyeshadow Stick that comes in 6 different shades. All 6 shades are wearable and all of the colours offered for me are like shades that people are not afraid to rock with. Basically you can do barely anything with these shades. It said that it is a runway classy look with those timeless smoky eyes with intense shades of black & brown. Claims to be a Just apply, glide & go products. Guys. Trust me. If an eyeliner is German made. Its going to be awesome. This eye pencil is wax based formula and also claims to be a long lasting and smooth blending eye pencil. Its waterproof and said to be smudge proof. What I like about it. Such a convenient product. 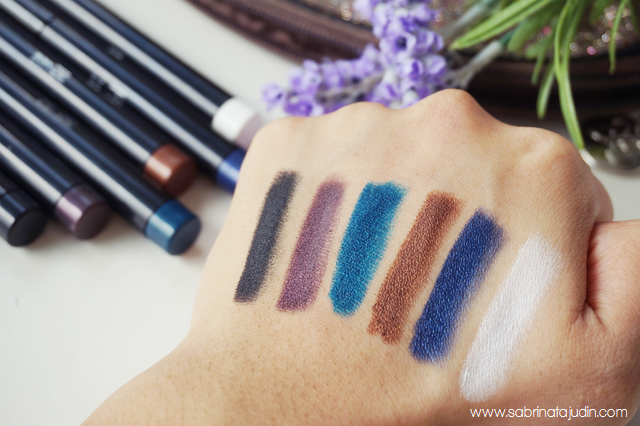 For example, I'm wearing a simple eyeshadow look during my day time and I kinda want to pump up my eyelook for a bit, I just grab this pencil, apply these dark coloured eye pencil on my outer lid and blend it a bit with my finger and I'm good to go. Oh yes, I love the one in White! It's pigmented but I find that NYX in Milk is much for creamier and "whiter". But this is still good as it is not too white it gives a nice sheer white highlight on my inner corner and under my brow bone without looking like too highlighted. Its retractable and its also comes with a sharpener. Its located at the shade label on the eye pencil I forgot to take picture of it. Sorry! Thats means you are not going to sharpen the whole pencil which I like, because I collect makeup and I don't like my make up to be shorter by day. Ugh. So the sharpener can help to make it sharper. What I was even thinking of saying that. Sharpener to sharpen. Haha! It glides so smoothly and for me, all of the color options is great! What I don't like about it. I would not recommend this to be use on your waterline/bottom part of your eye. Its kinda smudge by the end of the day. As the tip of this pencil is wide and the texture is creamy, you might not get a precise blend under there. If you really want to use it, try using an angle brush to apply it under your lower lash properly. Overall & Thoughts. The facts that it is such a convenient products. 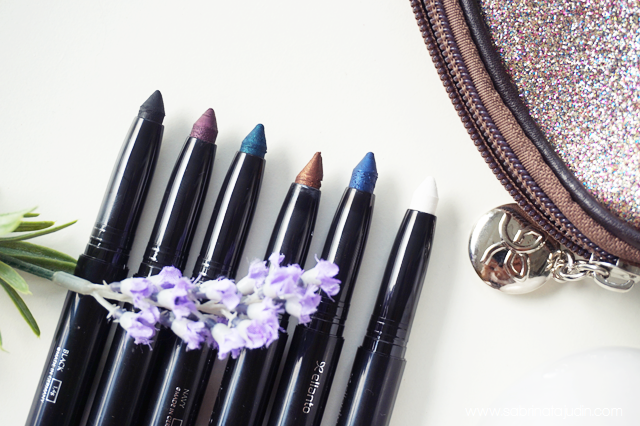 With a medium to large tip eye pencil you can basically go a lot of looks with it in just minutes. Kinda like a running errands fast makeup time. Glide glide glide, blend blend blend. You can leave it opaque or blend it to a more sheer finish. 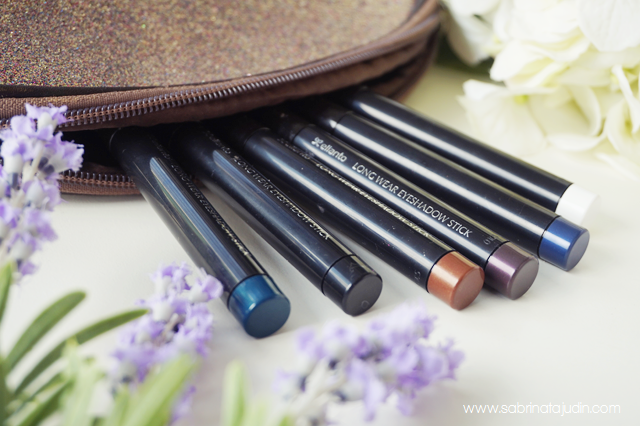 This eye pencil are also infused with Jojoba Oil that is Mineral Oil, Paraben & Preservatives free. Pretty easy to blend and love the fact that it is retractable. My favorite shade is White, Blue, Purple, Black, Brown & Green. I think I just pick all of them as my favorite! Haha! What is your favorite Elianto products? wow , it is so pigmented !